At this point I would encourage the use of a proper pruning technique. It will take a little longer but makes the correct cut a cinch. 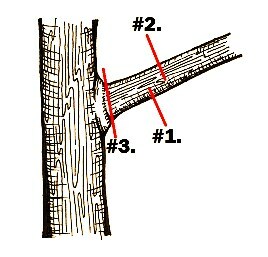 Below is a simple diagram of a very basic tree limb to be removed with this tree step process. First thing to do is go out the limb 15-20 centimetres and make a cut on the bottom side towards the top about 1/3 of the way through. Be careful you do not cut through to far as the weight of the limb has a tendency the pinch the saw. This small cut will prevent the limb from tearing down the trunk or remaining attached to the tree. Secondly make a cut on the top side of the branch 2-3 centimetres farther out. Keep cutting until the limb has been removed. At this point there should only be a stub attached to the tree. The third and final step is to remove the stub. Before any cut is made identify the the branch collar. This will be a raised ridge that slightly bulges out at the base of the branch. It is important not to remove this as it is from here that the tree will begin to seal over the cut. Position your blade so that it is just past the the branch collar and cut through, removing the stub. By doing this you have ensured that no tearing on the trunk has occured. Also by leaving the branch collar attached the tree can seal over the cut much faster. This helps the tree stay healthy as decay, disease and insects often enter through improper cuts and other wounds. The aesthetics of your tree are also improved leaving a finished look. This process should only be completed on smaller branches that are within reach from the ground. Please consult with a professional arborist if there is work to be completed aloft or when removing branches and limbs over 20 centimetres in diameter. Both are dangerous and could be negative to your trees health.